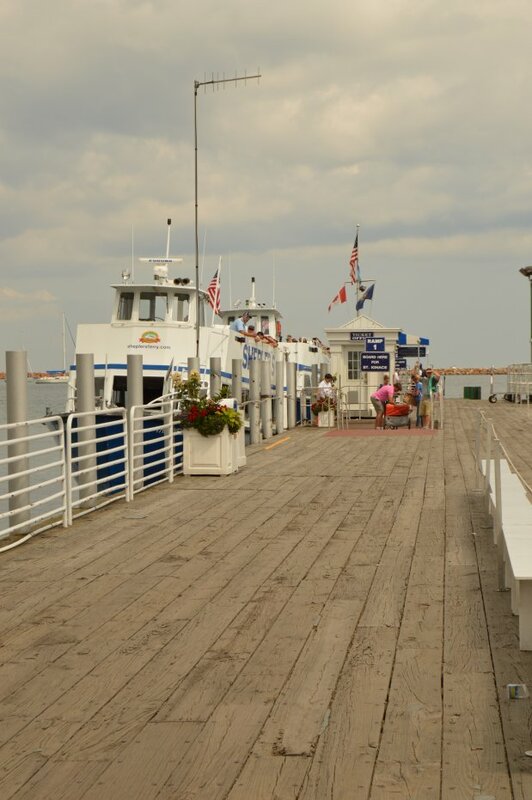 If you have ridden with us in the past few years, you will have experienced that our Island dock is small, congested, and typically just hard to navigate. This has not gone unnoticed by our team. Our company has never had growth like we have this year. With the increase in tourism throughout Northern Michigan, due in large part to the Pure Michigan campaign (thank you Travel Michigan!) and the closing of the third ferry line over the winter, the increase in traffic on our docks has prompted us to speed up the planning process. 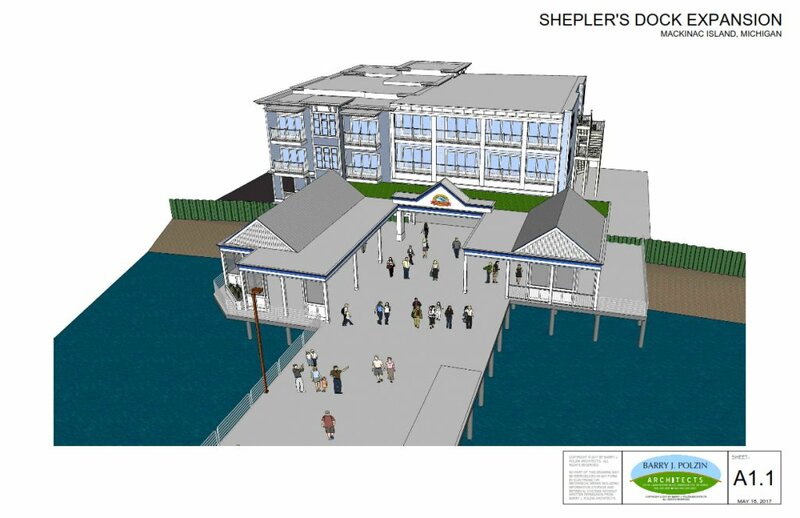 For the past 2 ½ years we have been developing a plan to expand our dock on Mackinac Island. This is not an easy task. There are many steps to getting approval from the Village, the Historical District, and the DEQ when planning any changes to a dock on the Island. Our first step of alleviating congestion this year was to move our freight operation to a different Island dock. Without freight carts and forklifts and pallets of supplies on the dock, we have freed up space for our guests to more comfortably move about the dock area. Our next step was to completely redesign the dock to accommodate more people and to separate the luggage and porter area from the street side to make getting on and off of the dock much easier. We hired an architecture firm to draw up plans and, as with any building project, there have been many revisions. Earlier, I mentioned that there were several agencies that needed to grant approval for the plans. One of those entities is the Mackinac Island Historic District. They are charged with maintaining the historic integrity of the Island – a very important task for a destination whose main draw is the historic value. Our first draft of the dock showed a covered passenger waiting area with glass garage doors that could be raised and lowered with a push of a button when needed, due to weather conditions. This plan was denied because garage doors = cars. Yes, we see the problem here. So, we replaced the overhead garage doors with sliding doors like you would see on a barn. This will keep this build within the historic parameters that the Island needs. Little details like this make all the difference in placing a building on Mackinac Island. If you take a look at the picture above, it shows our new covered waiting area to the left and our covered luggage and freight area to right. There will be enough space for 350 passengers to stand out of the elements. We will have overhead heaters for the chilly days of spring and fall and the doors will be able to close to block wind when necessary. This new waiting area will not just help us, but also will keep the sidewalks clear since the line will be contained on our dock. This expansion also adds 10 feet to the width of the dock. We will be adding a new ticket office, new lighting, a new speaker system, and new flowers by Barnwell Landscaping. All of these upgrades will bring our Island Dock up to the standards that our guests expect from us. The building above the walkway to the street is not sky boxes, as one commenter suggested, but a new hotel venture spearheaded by Melanie Libby and Ira Green. We have traded air rights for bottomland rights to make this plan work. The new $2.5 million hotel will have 35 guest rooms. The last step of the approval process is up to the Michigan Department of Environmental Quality (DEQ). We currently lease just over a half acre of bottomlands for the dock and this expansion will increase our bottomland needs to just under an acre. If approved, we plan to start the renovations mid-October and be finished by May 1, 2018 – just in time for the main tourism season. We are constantly looking for ways to improve our guest experience. This is just another step in that process. Over the next couple of years watch for new parking projects in both Mackinaw City and St. Ignace. We’ve also just begun talks about the possibility of adding another boat. Watch Facebook and Instagram this winter for updates as we progress through this expansion project. We look forward to seeing you on our new dock next year! Always a pleasant journey to the Island and return. Your boats are neat, orderly and comfortable. Thank you. Thank you, Larry! We hope to see you again soon. We always use Sheplers for our annual trip to the Grand. We leave from St. Ignace. Always courteous people take care of our luggage and we know our vehicle will be safe! Marcia, Thank you for being a loyal St. Ignace guest. Isn’t it great up there? The Welcome Garden designed by Barnwell Landscaping was a great addition to add to the ambience of the whole dock. Hopefully you have been able to take a break in one of our adirondack chairs when you are waiting for one of our departures. We look forward to seeing you on your next trip to the U.P. Bravo for Shepler’s – always on top of it and our family’s only boat to the island. Thank you, Kathie! We are able to do all of this because of our loyal guests like you and your family. We look forward to seeing you on the new dock! Very nice. We use your service e ety year, for 6 years now. My question is where will we drive now when we stay on the island and use your service to park our car? Cynthia, Thank you for using us for the past 6 years. Our overnight parking will not change. Still come to our dock unloading area where we’ll help you with your bags. You can make parking arrangements at the ticket office or online before you arrive. See you next year! I have used your services the last 11 years but I understand this year if we choose to utilize the parking adjacent to the Dock area we must park our own vehicle after unloading instead of the previous practice of having one of your cast-mates park the vehicle. The change in practice means reliance on a shuttle system and no more being “texted” where our vehicle is parked on the return trip. Lynn, you are correct that our parking has changed and we are no longer offering the valet service. However, if you park right at the dock, you will not need to take a shuttle as you are just feet from the boarding area and your car will be right where you parked it when you return. We hope you enjoy your trip! What a fantastic concept. Looking forward to seeing progress reports, along the way. Very exciting. Thank you, Sam. We are really looking forward to getting started on the project. Watch our Facebook page this winter for regular updates. The planned improvements will enhance the experience of our guests. Shepler’s has provided world class service for the 33 years we have lived and owned a business in Mackinaw City. Congratulations on implementing these enhancements! Thanks, Bill! We can’t wait to see the finished product. Thank you for your continued support for our family business. Congrats to the entire sheplers family. Looking forward to seeing your new facility. It looks like it will be as top notch as the service you provide. Thanks for making the experience to the island and back as special as the island itself! Todd, thank you so much for the kind words. We put our motto of “First Class Service. Every guest. Every day.” into every project we undertake. We’re so happy that you have enjoyed our service and hope to see you on the boat on your next trip! Jane, Thank you for the comment. We really want to make our guests feel comfortable and have an enjoyable time. The horse board might be the only entity that we do not need approval from. 🙂 See you next year! Fantastic! Excited for this project to unfold and I can’t wait to see it completed! Melanie, we can’t wait either! Follow our progress on Facebook throughout the winter. Yeah Shepler’s!!! What a great plan. Can’t wait to stay in the new hotel for our 20th anniversary trip to the island!! Capt Shep & Hawkeye must be very pleased!! Thanks, Noel and Mary. Yes, I am sure that Cap and Mrs. Shepler will be pleased with outcome of the new dock. We sure have come a long way since they started the business in 1945. Your company is the only ferry we ever take over to the island. Your employees are always polite and professional and your facilities are always clean. Thank you for thinking of our comfort and the integrity of the island, our favorite place to visit! Looking forward to our visit next year! Denise, Thank you for your continued support of our little company. We are only still in business because our our loyal guests like you. We can’t wait to see you and your family on the boat next year! Looking forward to our spectacular “ride” in September. Glen Erin Pipe Band would love to play for the Grand Opening! David, That would be amazing! We’ll be in touch. The only way we get to Mackinaw Island. So many years I can’t remember. So professional. Thanks, Toni! We appreciate your continued support, even if you can’t remember how many times you been on the boat. Come back and see us again next year! Will the new hotel be next to the Bicyle Inn? Denny, It will be right next the Bicycle Street Inn Waterfront Collection. The only ferry I have taken to the island since I was 10 with my parents – and now I’m 50ish with kids of my own who go with me. Service is always great, cast is very efficient and funny on the rides back and forth and looking forward to the new and improved look on the island! Thank you for riding with us for more than half our existence! 72 years and still going strong. We hope to see you for the next 40 years! That’s awesome!!!!! Can’t wait to see it! Deb – we can’t wait either!! Wonderful to watch you grow! It is always nice to visit the Island and know Shepler’s has their customers comfort in mind. We can’t wait to see the progress. Keep us update. Hope to see you Misty when we visit in the spring. Hey, Mona! Long time, no see! So happy to hear that you will be coming back up in the Spring. I’ll see you then! What an amazing plan! My family can’t wait to see the new space and enclosures next year! It’ll be nice to be under a roof in case of inclimate weather! Your employees are always friendly & helpful and it’s nice to see a very clean dock, boat, even the restrooms! This is now the only ferry we use, and have been for the last 16+ years! April, We wish there wasn’t a need for enclosures. We used to have a captain here that when people asked what the weather was like on the Island, his response was, “It’s always 70 and sunny.” Oh, if that were only true… Thank you for riding with for 16+ years. We’ll see you on your return trip! Love your comments! Yes, we require our cast members to be squared away for sure. We look forward to impressing you again on your next trip! Pat, we are super excited for the enclosed waiting area that can be open on beautiful days. Just that fact that our guests will be able to be on our dock instead of the sidewalk is a huge plus. We know that change is difficult, but we think this whole project will be a beautiful addition to the Island. One of he features of the new hotel is that the roof near where our awning is will be green, planted with grass. We think that will enhance the property and it will be good for the environment. Check it out on your trip next year and let us know your thoughts. Very exciting things. Sounds like a trip in the spring will be in order for next year. This is very exciting and I can’t wait to see the finished product!!! Thanks, Denise! We are so excited about this project. We haven’t been this excited since we built the Miss Margy. We could get used to huge announcements like this every 3 years. See you on your next visit! Approved expansion of your facilities in keeping with historic guidelines is appreciated for those of us choosing Shepler’s for decades. The hotel is an eyesore. Judith, decades?! We can’t thank you enough for helping us stay afloat! (See what I did there?) 72 years and still going strong. We hope that you will be pleasantly surprised when you see the new facilities on your trip next year. We have always chosen your ferry for the trip and even enjoyed the lighthouse west trip to see the lighthouses. We will continue to use your ferries. Never was bothered by the crowds and weather……after all this is Michigan. Helen, We are so glad to hear that you have ridden with us and taken our lighthouse cruise. Yes, the weather here is ever-changing and we’re pretty used to it. We do get a lot of visitors from southern states that say this is quite a shock to their system in the spring and fall. (Or even August, as this week our highs have been in the low 60s.) As far as the crowds, we welcome them! Come one – come all! We just want to be better prepared to handle them in a favorable and pleasing way. When you start looking at a group of people as group, and not individuals, you start losing guests – and that is the last thing we want to do. We look forward to seeing you on the ferry, and possibly another lighthouse cruise in the future. Thank you for your continued support of Shepler’s Ferry! Bravo Sheplers !!! Have always used your wonderful ferry line for years when coming to Mackinac Island. You service and dedication to your customers is outstanding. So looking forward to the completion of your future endeavors. Chantal – thank you for visiting us from Saginaw! We can’t wait for you to see the new dock when it is completed. We’ll be updating our Facebook page all winter with the progress, so if you are not already a fan, like us there to see what we’re up to. My opinion may/may not be a popular one, but I respectfully share it because of my love for Mackinac Island. We’ve enjoyed using Shepler’s for our annual visit to the island for many years. I can understand the need for a bit of expansion and I like your plan with one big exception… the “hotel venture spearheaded by Melanie Libby and Ira Green” I believe will dramatically alter (in a not so desirable way) that which we love most about the island. I’m still saddened by the loss of the historic home in the downtown area that was leveled to build what feels too much like a suburbia shopping mall, complete with Starbucks. This proposed 35-room hotel is quite an imposing structure and not something that I think will enhance the downtown area, but rather expand upon the suburbanization of the island. Mackinac Island is an extremely special historic treasure, not just for Michigan, but in our country. I come there every year to enjoy the natural and (historic) architectural charm and traditions of the island. Many longtime residents and business owners on the island have proven to be very committed and thoughtful stewards of that which makes the island special. Shepler’s is part of that special history. Please take care, however, not to dismantle what has been carefully cultivated by generations of people who have keenly understood what improvements have enhanced the island, and what doesn’t. In my opinion, the hotel portion of this plan ventures further into what doesn’t. Claire, thank you for the comments. We definitely understand your point of view. The hotel has to follow the same strict guidelines set forth by the village and Historic District Council. We trust that they will help keep that historic feel even with a new building. We look forward to seeing you on your 2018 visit and we hope that you will share your comments with us once you experience the new dock. Shepler’s continues to spread pixie dust to make things better for the area and their guests, and is always looking toward the future positively. Ira Green has developed many great venues and I know this one will continue that tradition. Can’t wait to come back for our next trip!!! We only ride Shepler’s…. Ah – pixie dust! Yes, we’re always trying spread pixie dust and create raging fans. Thank you for being one of them! Shepler’s is always thinking ahead and this is a typical example of that. May your new project go smoothly and be as wonderful as your other projects such as the “Miss Margie.” You have the cleanest and best boats in Mackinaw. Of course, we all know the reason why. You take the best care of them, like cleaning them after each trip! Adding to that, we really love your Lighthouse Cruises and the Dark Sky trips. Great ideas. Hope you have more of these cruises as well. Chuck, we take a lot of pride in everything we do. Thank you for noticing. This project is a big undertaking, but we know we’re up for the task. Our cruises will continue next year. Watch for those schedules to be available between December and January. Great Idea!!! George Till/ Chelsea MI. Looks fantastic. Thank you for all you do for the area. I am a summer commuter and through the years you have never disappointed. Thanks, Kurt! Thank you for traveling with us on a regular basis. We truly appreciate your business and we can’t wait to see the new project get started. I’m looking forward to seeing the new reception area. As a kid, I watched our beautiful Mac Bridge being built and now 61 years later the new Sheplers. My parents, daughter, grand-daughter, great-grand-daughter and I have only taken Shepler’s. I can’t wait to see the new dock next year. Keep up the good work and good luck. Thanks for the enjoyable ride! Thank you for being such a loyal guest over the years. We look forward to seeing you on the boats for many years to come. Best wishes in the fulfillment of the new plans! Shepler’s hold a special place in our family’s long traditions of visiting the island several times a year. My husband and I also had the great pleasure of having our unforgettable sunset cruise wedding reception aboard one of your boats! So we’re very happy for you all and excited to experience the end result. Cheers to smooth sailing!! Thank you for the nice thoughts. We are so happy that we could be a part of such a special day for you. We can’t wait for the improvements on the dock over the winter. Be sure to visit us and tell us what you think of the changes next year! My family has used Shepler’s since the 1980’s or earlier. My 4 sisters and I come to the Island for our “Annual Sisters’ Trip” the end of every September. We look forward to this year’s trip, in 2 weeks. We also will be interested to see the new facility, and hope that it still has the “Shepler’s Feel” that we have come to love over all of these years. We hope you had a great trip last week. We definitely will make sure that the new dock has the Shepler’s feel to it. It just wouldn’t be the same without the blue and white stripes, right? See you next September.